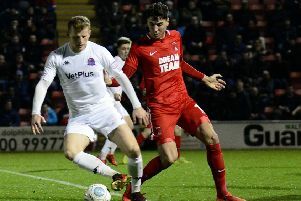 Dave Challinor believes Nick Haughton is still a “work in progress” and has challenged the midfielder to improve, despite scoring his first AFC Fylde goal at the weekend. Haughton scored the decisive goal as the Coasters laboured to a 1-0 win against Biggleswade Town in the FA Trophy. It was the 24-year-old’s first goal in 13 games since arriving at Mill Farm at the end of October and Challinor wants more from his attacking midfielder. The Fylde boss said :“He’s got his goal, great. He’s been threatening for a while but he needs to give us more. He needs to look after the ball for us when games are tight. “We’ve got possession of the ball in the last minute of the game but we give it away. “One kick down the middle and we’re reliant on the linesman’s flag to stop them going through one-on-one with our goalkeeper. “We spoke about it at Bromley at half-time last week. We spoke about what are you bringing to this party? What are you bringing to this team that maybe other people aren’t? “And what do you provide when we’re on top in games? What do you provide when we’re in possession of the ball? “But on the flipside, what are you doing when we’re out of possession? What are you giving us when it’s not a nice game and it doesn’t settle down? We have to be given more. “So I’m delighted for Nick to get his first goal but he’s still a work in progress. Challinor is hoping to have two or three players back from injury for this weekend’s test against promotion rivals Wrexham, with Ryan Croasdale, James Hardy and Luke Burke all nearing a return. Mason Bloomfield won’t be back until the end of February at the earliest after suffering a compound fracture to an arm 23 minutes into his Fylde debut. Challinor said:“We’re hoping to have Crossy back for weekend. He’s progressed quite nicely, so has James Hardy and hopefully he will step up his recovery. Next weekend might come too soon for him but we’ll see. “Mason had his operation and will see the consultant. He’s back in Norwich and best case scenario is end of February.